“Came here for the horsepower!” -Devin Recent Tuner School graduate, Devin, talks about his time at Tuner School. Would you like to learn how to make fast cars faster? Check out Tuner School where our classroom includes a chassis dyno cell and a 1/4 mile dragstrip – all on the Hennessey Performance campus! 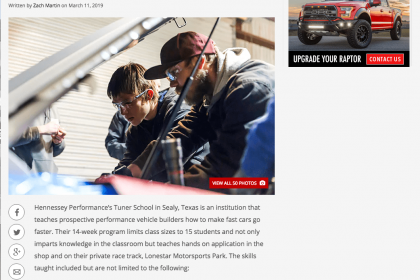 Recent Tuner School Graduate Testimonial Would you like to learn how to make fast cars faster? Check out Tuner School where our classroom includes a chassis dyno cell and a 1/4 mile dragstrip – all on the Hennessey Performance campus!